Conventual Franciscan Father Berard Dudek was a former pastor of St. Casimir in Canton. 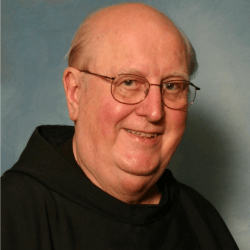 A funeral Mass for Conventual Franciscan Father Berard Dudek will be offered June 8 at 11 a.m. at St. Casimir Church in Baltimore. A Baltimore native who died June 4 at age 89, Father Dudek served three stints at the parish and had a number of other assignments in the Archdiocese of Baltimore. Father Dudek was born in Baltimore, but attended St. Francis High School in Athol Springs, N.Y., St. Bonaventure University in Olean, N.Y., and then St. Hyacinth College and Seminary in Granby, Mass. Ordained in 1954, he spent the next 17 years at Bishop Ryan High School in Buffalo, including one year as its principal. At St. Casimir in Baltimore, he was assistant pastor, 1971-76; parochial vicar, 1994-95; and then pastor, 1996-97. Elsewhere in the archdiocese, he served as guardian and pastor of the former St. Stanislaus Kostka in Fells Point, 1976-82; associate pastor of the Basilica of the National Shrine of the Assumption of the Blessed Virgin Mary in Baltimore, 1982-84; a teacher at Archbishop Curley High School; 1983-84; and vicar provincial of the St. Anthony of Padua Province, 1985-88. Retiring in 2005, he moved into the Franciscan Friary at St. Mary Clement Hofbauer in Rosedale, where the pastor was Conventual Franciscan Father Donald Grzymski, now the president of Archbishop Curley High School. “It was a real pleasure to know Father Berard, and to share friary life with him,” Father Grzymski wrote in an email to the Review. “He was always a gentleman, interested in people on a one-to-one basis, and with an active mind to the end. Father Dudek also served in Pennsylvania, New Jersey and Connecticut. An obituary provided by the Conventual Franciscans noted that Father Dudek’s interests included music and developing his computer skills. Visitation will be St. Casmir June 7, 3-7 p.m., with a Franciscan wake service at 7 p.m.